Henize 70 (N70, DEM L301) is part of the Large Magellanic Cloud in the southern constellation of Dorado about 170,000 light years distant. 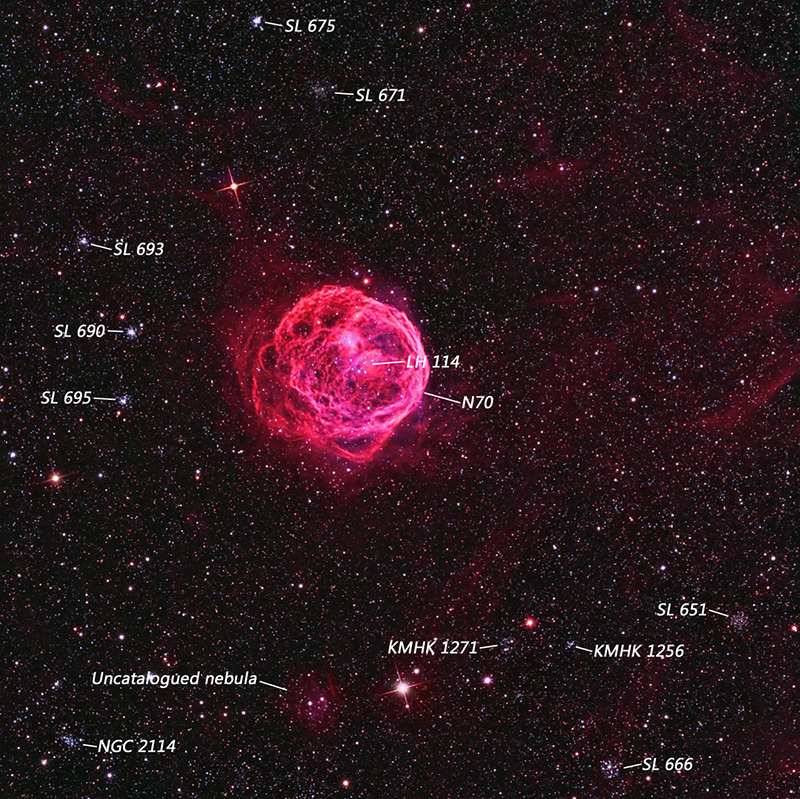 Henize 70 is a superbubble in which fast, energetic stellar winds from massive, hot stars (OB association LH 114) clear out a bubble from the surrounding interstellar medium. You can see a group of hot blue stars near the center of the bubble. The energy released into the bubble ionizes elements, such as hydrogen, oxygen and sulfur, and causes them to glow. It has also been suggested (Skelton et al., Pub Astro Soc Pac, III, 465-481, 1999) that supernova explosions within the last million years also contributed to the structure of the nebula. The nebula is about 300 light years across. North is up and the field is ~ 33′ x 33′. 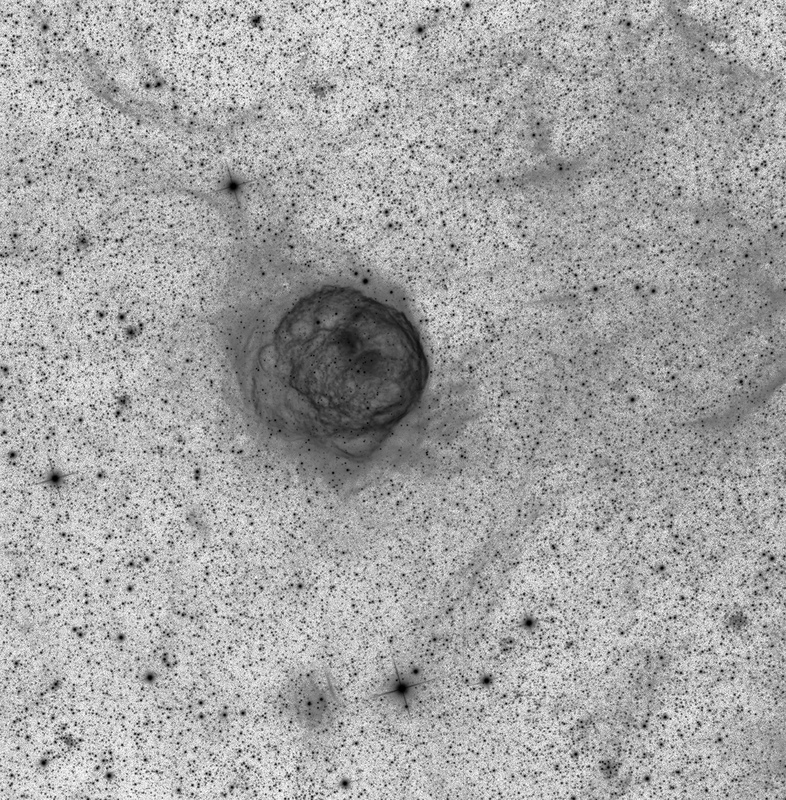 There appears to be a trail of H-a emission nebulosity extending from the nebula and widening toward the right. It is likely that this represents the interstellar medium (ISM) surrounding Henize 70. An inverted H-a image is presented below to better see this background feature. 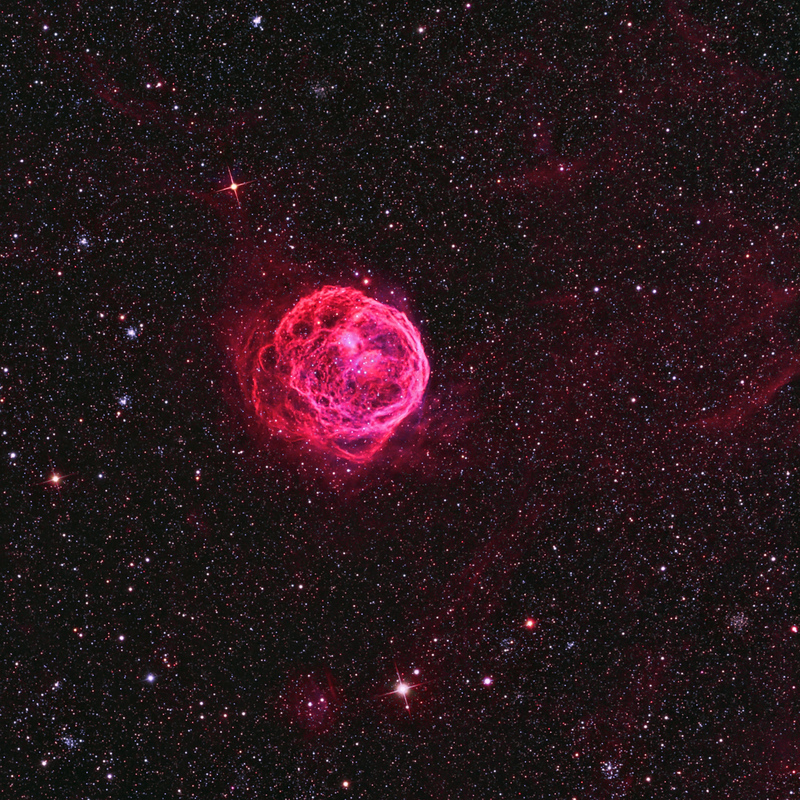 In this deep, colored image above, narrowband filters were used to bring out the structural detail of the bubble. They were processed as “natural color”, where hydrogen and sulfur were mapped to red and oxygen to blue-green. Shorter exposures through red, green and blue filters were added for star colors. Other objects are labeled in the image below (courtesy of Sakib Rasool). SL represents the Shapley Lindsay catalogue for clusters in the LMC published in 1963. KMHK is a newer catalogue published in 1990. There is one object near the bottom of the image that does not appear to be catalogued.